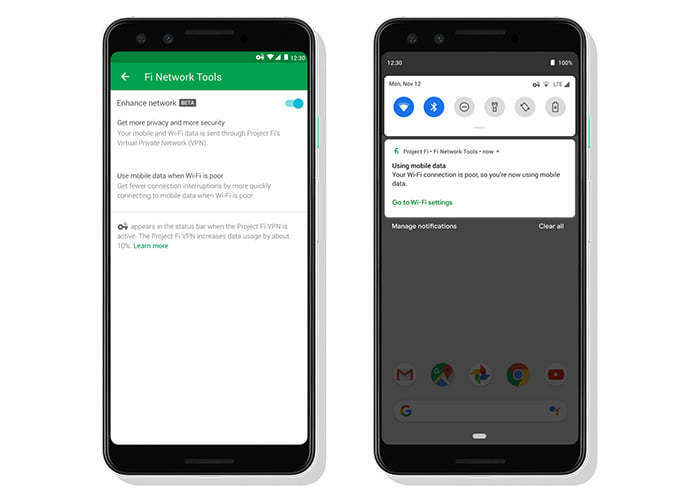 Google's Project Fi Update Brings "Enhanced Security" & "Enhanced Network"
Project Fi, a Google venture, receives a few upgrades this week in the form of enhanced network and security features. The enhanced network toggle, due to roll out during the week, provides improved privacy and security. Google will extend the Project Fi VPN to also cover LTE connections. Before, the VPN only covered you while on public WiFi networks, however, with the new enhanced network option, the Project Fi VPN will secure your connections at all times. What’s more, Google promises that the new upgrades will speed up WiFi to LTE trade-offs. I.E. The time it takes for your phone to switch from a WiFi connection to a cellular one when you move around. Google claims that the switch can be reduced by up to 40%. Our enhanced network automatically detects when your Wi-Fi connection becomes unusable and then fills in those connection gaps with cellular data. If you’ve ever left your house and walked toward your car, you might have noticed your connection slows or even stops altogether as your phone clings to a weakened Wi-Fi connection. With our enhanced network, you’ll have a seamless connection on the go, and waiting to be reconnected becomes a thing of the past. In our testing, we’ve reduced the time without a working connection by up to 40 percent. The new upgrade will ship to smartphones that are on Android P and on Project Fi. You can find the enhanced network toggle within the app under “Fi Network Tools.” Read Google’s blog post for more information.